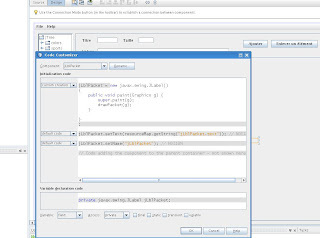 totalprogUS: Overriding paint dans Netbeans. If you wan to override the paint method in Netbeans, you can't ! Et il vous sera impossible d'overrider la méthode paint. In design interface, make a right click on the component then choose customize code. To override paint, you have to change the initialize with "custom creation". So now, it's possible to override paint method !